It’s common practice to grill outdoors. However, due to some outdoor elements, it could be impossible to do so. This is where a smokeless indoor BBQ grill will be useful. 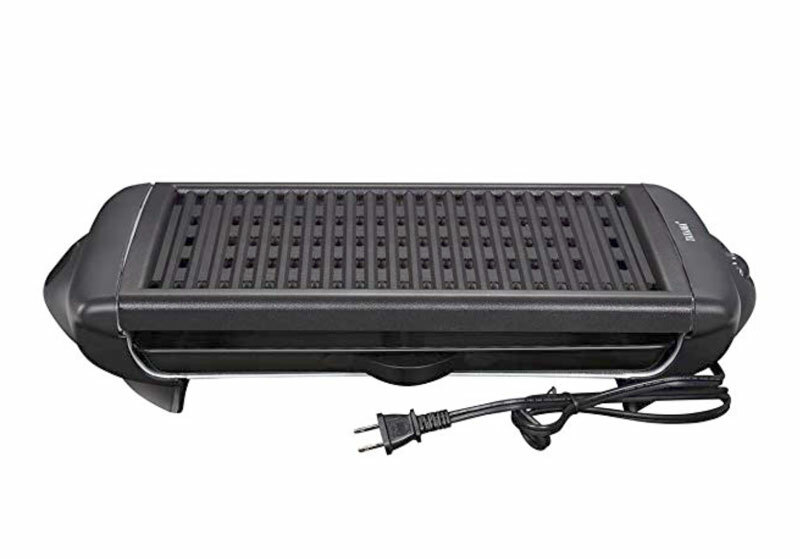 A smokeless indoor electric grill eliminates smoke that can wreak havoc indoors. This makes it a safe choice for small apartments and condominiums. However, buying the best one isn’t an easy task. So in these smokeless grill reviews, we will help you pick one that gives the best value. 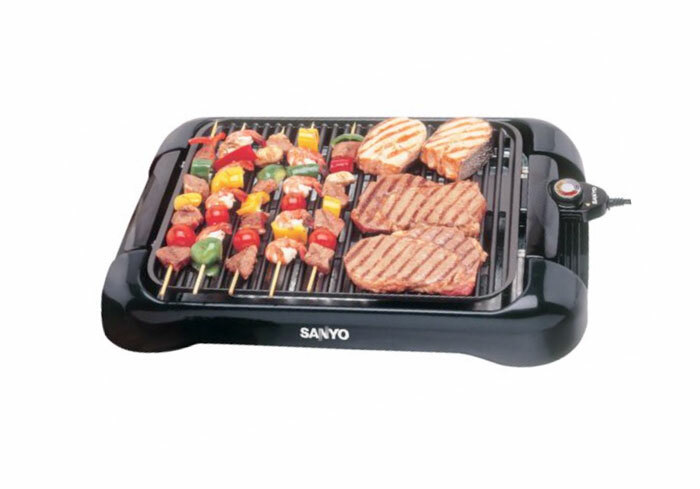 Smokeless indoor grills possess different functions. Likewise, each has varying features that add functionality and convenience. Still, it’s important consider what you need for cooking. Is it an open tabletop, stovetop, or closed tabletop grill? 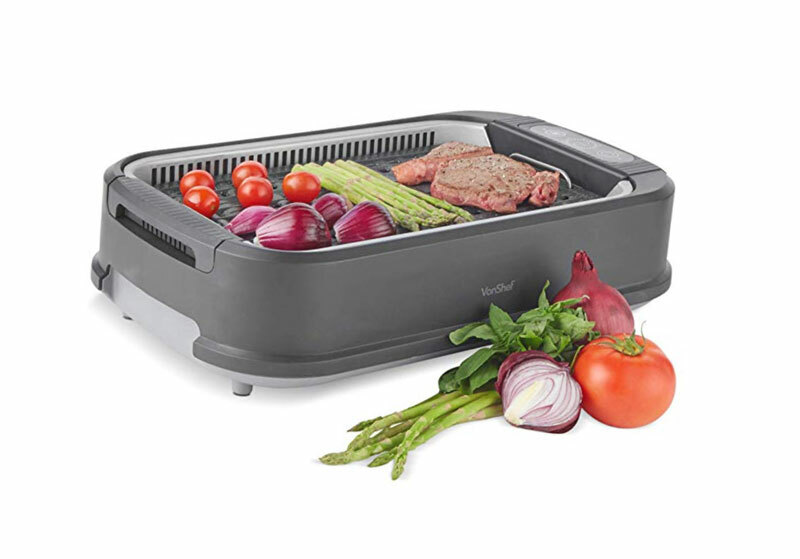 As its name suggests, this indoor smokeless grill is intended to fit on top of your table or counter. It acts as a hot cooking plate that usually functions through a direct-to-wall electricity plug. The main benefit of buying an open tabletop is it offers more cooking space. However, since it doesn’t have a lid, there’s a higher chance of spills and splatters. Overall, a tabletop grill has buttons or knobs to tweak the temperature. Unlike the open tabletop grill, the stovetop grill can’t generate heat on its own. Instead, it has to be used on top of the kitchen stove to cook. 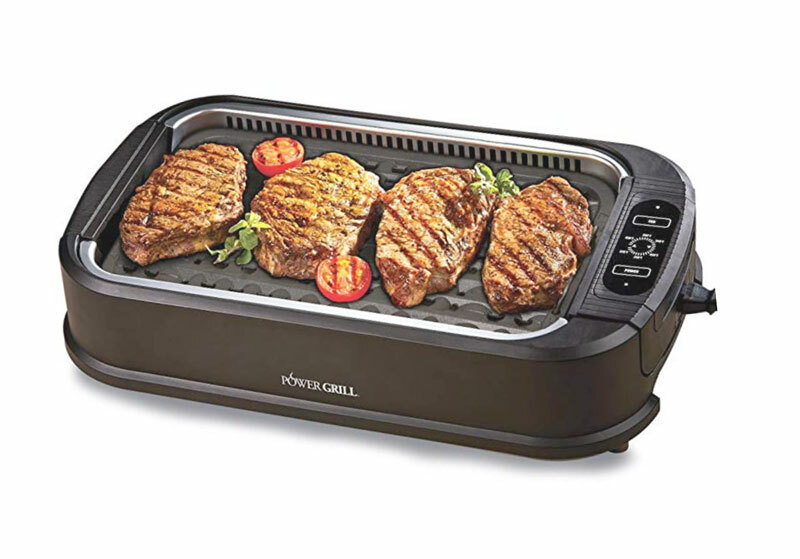 With this type of indoor grill, you need to use the knobs of your stove to control its temperature. You have full control of everything except that this doesn’t have a drip cup to catch grease. Mostly, a closed tabletop grill shares the same construction with an open countertop unit. The only difference is it comes with a lid to trap the heat. Although closed tabletop grills usually have a smaller cooking area than other grill types, it’s more efficient in cooking. Since the lid traps the heat inside, cooking becomes faster. Take note, though, that closed tabletop grills are not suitable for preparing thick food items as the lid can get in the way. The Gotham Steel Electric grill sports a no-stick grid where you can cook without the mess. It’s also cool to touch, not to mention the addition of a griddle insert for dual purpose. This electric smokeless grill is smoke-free with solid aluminum construction. Also, all of its grid and drip tray parts are dishwasher-safe together with an easy-to-clean base. 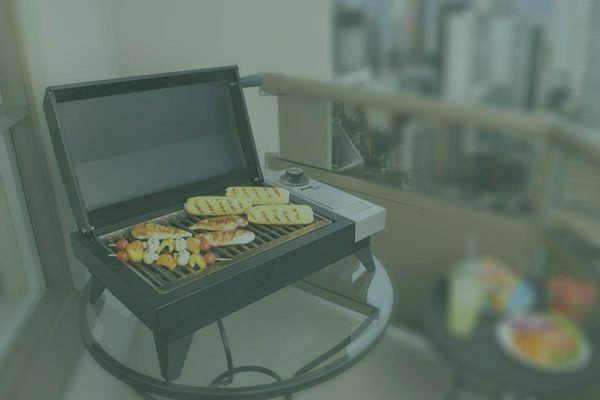 The Gotham smokeless grill is compact enough to be used on dining tables. And with the temperature plug, you will have full control over your cooking. With the VonShef grill, you can now taste the classic grill flavor sans the suffocating smoke. Thanks to its hidden fan inside the grill, this is guaranteed to be smoke-free. Its 14” x 8” cooking surface is great for lean grilling. The grease that came from the food will be collected to the drip tray. This grill is also best for cooking crisp veggies and chargrilled steaks. To add, this sports a LED touch panel to control the temperature and put the built-in fan in use. This versatile grill comes with two interchangeable plates. There’s also a sturdy glass cover to maximize the heat while cooking. Like the VonShef unit, this grill has a smoke extracting fan that makes it virtually smokeless. After cooking, the removable parts are safe to toss into the dishwasher for your convenience. Simple controls, great temperature range, and lean grilling – there’s nothing else to ask for. 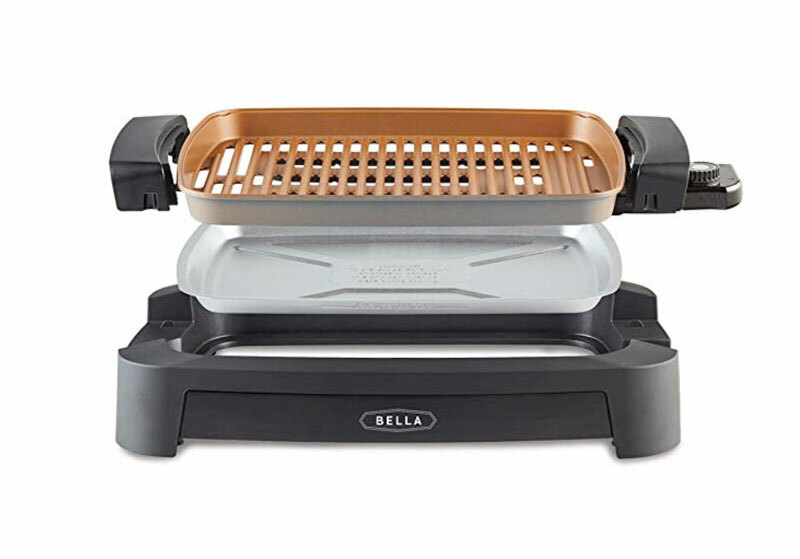 The BELLA grill uses a 1,500-watt heating mechanism for fast yet efficient cooking. 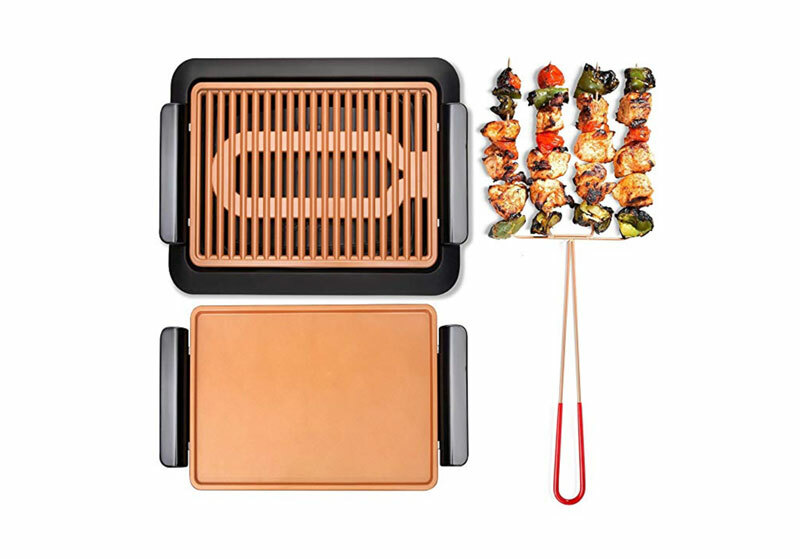 Also, the grilling area is coated with copper titanium for long-lasting use. This grill is a staple for all kitchens. You can use it for sautéing, steaming, grilling, buffer serving, and heating meals. Overall, the BELLA grill has a no-fuss design that’s effortless to clean and maintain. It also has a temperature knob that you can set up to 450 degrees. 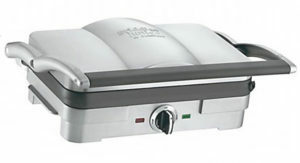 This T-fal grill is a dual-purpose unit that functions as a grill and a sandwich press depending on how you use it. This works using the two modes of cooking: manual and frozen food. The good thing with this 1,800-watt grill is it fine-tunes the cooking cycle based on how thick the food is. With two pressing surfaces, your food will be cooked fast and with even heat. Also, T-fal has a tilted construction that helps remove the excess grease from your meals. It’s great for burgers, sausages, chicken, seafood, meat, vegetables, and more. 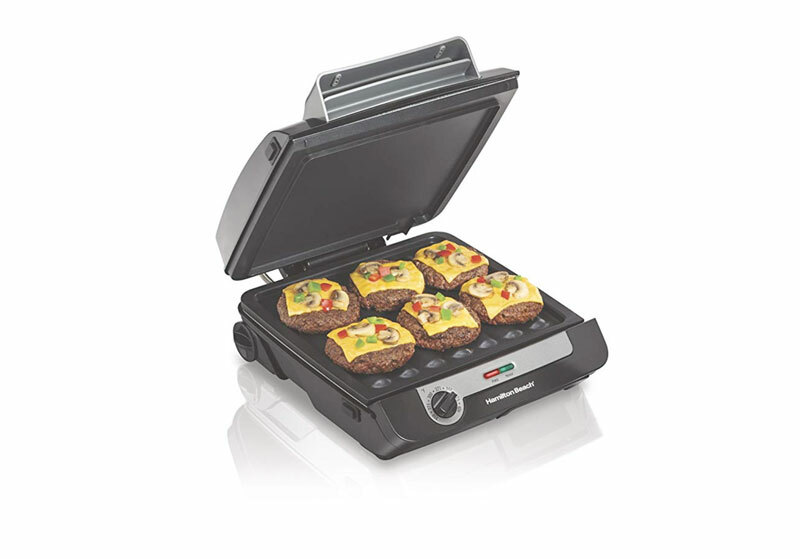 The Tayama Electric Grill offers a high-quality, table-top grill. Its simple construction gave way to more cooking surface of 15” x 10”. It uses a temp knob for precise cooking plus non-heating handles to avoid burns. But to avoid peeling and drying, always add water on the drip tray before using the grill. The Tayama electric grill is great for buyers scouting for a large grill with low maintenance needs. Besides, this unit is also one of the affordable smokeless indoor grills you can find. 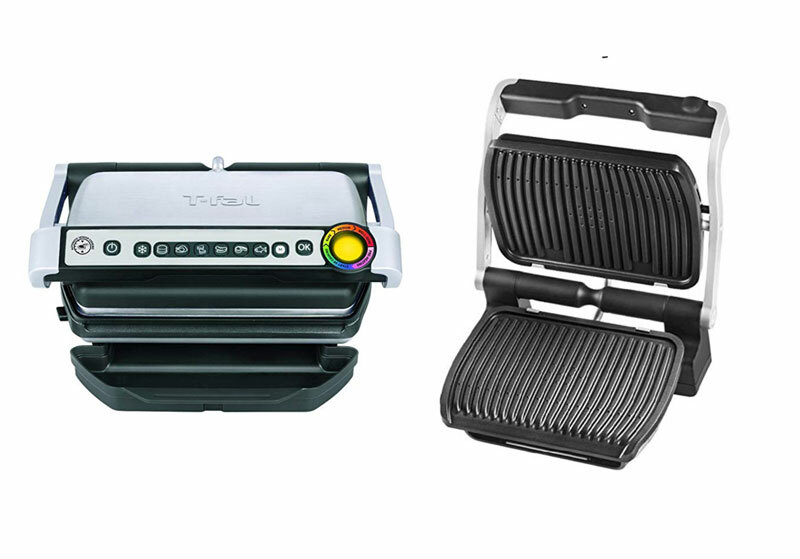 Do you want a grill and a griddle without buying another appliance? This Hamilton Beach unit utilizes reversible cooking plates that let you to pick one that you need. With two types of cooking surfaces, you can sear, sauté, grill, and prepare various food items in one batch. Both the two cooking areas have separate temp controls for precise heat levels. This unit also has a drip plate between the plates for a mess-free cooking experience. Also, you can easily clean the drip plate and grills through the dishwasher for utmost convenience. Cuisinart is a household name in terms of grill appliances. True enough, their GR-3 tabletop grill is something grill masters at home should try. It uses with a floating cover with a hinge construction. This can be used as a sandwich press or an extended cooking area. This can function as a contact grill too. The non-stick grids can be removed and can be washed through a dishwasher. It also has a drip cup that’s also easy to clean. Also, this compact unit comes with some cleaning tools for hassle-free use. 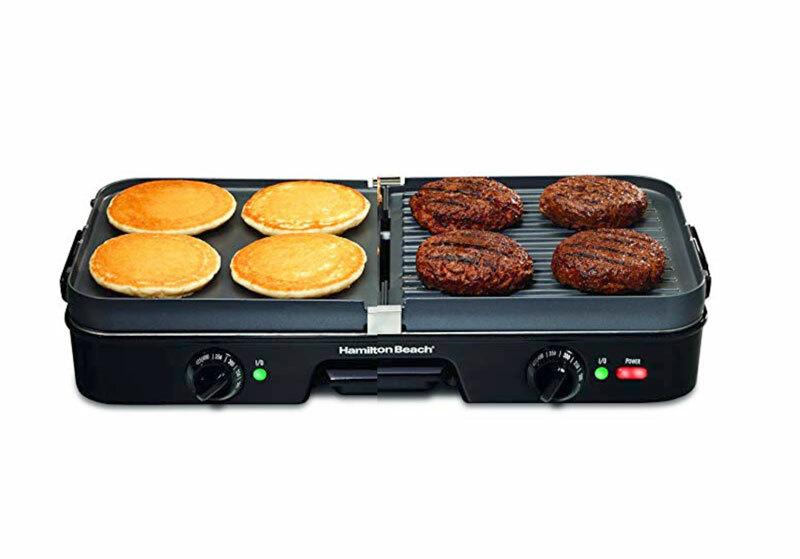 The Hamilton Beach Multi-Grill is best for those flying solo or preparing for 2 to 3 people. This small tabletop grill sports an open flat grill and a griddle combination. It shares the same construction with T-fal which allows efficient lean grilling and cooking with even heat. Also, the kickstand prevents any splatter when cooking high-fat meat. All the cooking grids as well as the drip tray are safe to clean in the dishwasher. And if you always crave for bacon, you simply can’t miss this BBQ indoor grill. 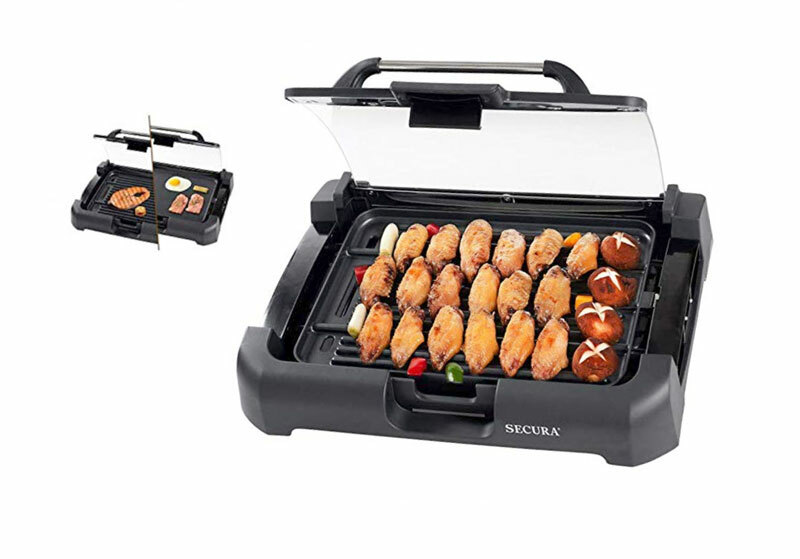 Secura has a reversible grilling plate that where you can grill or use it as a griddle. Also, it comes with an attached yet detachable glass cover to trap the heat. This unit has a massive cooking area so you can sear more food in one batch. It saves you some cooking time and it allows easy movement of the food inside. With Secura, there would be no splatters, oily mess, and intense cleaning. Most of the removable parts can be tossed to the dishwasher. It’s exciting to have the best indoor grill but it’s not always an easy decision to make. Like buying an outdoor grill, it’s important to check the features that will work for you. 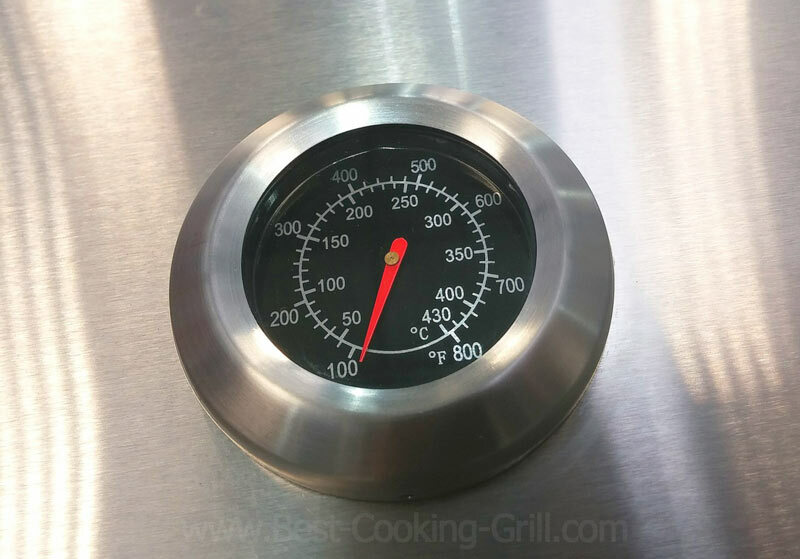 The temperature level of the grill determines how efficient it will be for cooking. However, it’s not just about getting the highest cooking power. You should also look for precise controls. As you know, each food item requires a different temperature level. For example, a slice of thick meat will need more heat than crispy vegetables. Consider getting an indoor grill with a heating power of at least 1,500 watts that can cook within a wide range of temperatures. Your choice of indoor barbecue grill should not be difficult to wash and store after each use. Most grill models you’ll find today can be cleaned through the dishwasher. Also, the no-stick cooking grids make washing easy. Also, you can opt for a unit that reduces spills and leaks. With this, you can spare yourself from the burden of scrubbing stubborn grease and food bits. The size of your grill should match the amount of food you plan to cook. Check how hefty the cooking area is to measure how much food it can accommodate. Also, the weight should also be taken into account. Since most indoor grills are tabletop models, it’s just right that it’s lightweight enough for one person to carry. Still, it shouldn’t be too flimsy that it goes out of place during cooking. Aside from temperature controls, look for a smokeless indoor BBQ grill with an easy-to-push power button. Depending on the features, there should be dedicated buttons for a smoke extracting fan and various cooking modes. Also, it’s best to buy a grill that uses a power button. This will be an added safety aspect for the user, especially if there are children around. Although indoor grills don’t use charcoal, some units can still imitate the smoky taste of the usual outdoor grills. If you want the same, look for a grill that can give the same taste, especially one that can toast grill marks. Still, don’t compromise the cooking performance for this. When buying an electric smokeless grill, always choose a sturdy material. Due to extreme heat during cooking, substandard materials can easily warp, chip, and peel. The grill should also be rust-free and made from durable steel. Also, pick a unit with an ergonomic construction. It should be efficient in dripping oils and grease without compromising stability. In fact, it’s ideal if the grill unit has a kickstand so you can tilt it for better dripping. Are you new to indoor grills? Here are some points to guide you. Q: Will an indoor grill cause fire alarms to set off? What is best choice, an indoor unit or an outdoor one? Why should I buy an indoor grill? What indoor grill should I buy? How should I clean an indoor grill? A: If the unit is well designed, it shouldn’t emit smoke that will be cause smoke alarms to engage. Both of these grills are great. However, they are only as good as when you need them. Outdoor grills allow a larger cooking area plus you can achieve the classic smoke flavor. Meanwhile, indoor grills are best if you live in an enclosed apartment or condominium. An indoor grill is a convenient way to enjoy your favorite BBQ recipes. And since it doesn’t emit smoke, it’s totally safe and mess-free. The answer boils down to what you actually need. You can check our buying guide above to see what suits you best. Remember that indoor grills have electrical parts that shouldn’t be washed. Always refer to the instruction manual that comes with the unit. Indoor grills are ideal whenever the whims of the outdoors get in the way. However, you should pick one that suits your cooking needs. Remember that not every model can cook up to your expectations. Above all, it’s better to invest than to settle with a dud unit.